I was frozen in fear. So many phobias were kicking in at once. Unharnessed, unsafe and unhappy, I was clinging to a chain ladder on a cliff, twenty metres above the path. My legs wouldn’t work, my arms were trembling and my eyes were clouding with tears. I was in a hard place, stuck to a rock. It was my second time there that day. Equally petrified on the first occasion, I had gritted my teeth and climbed the ladder, spurred on by the thought that the Tugela Falls awaited me, further up the path. My friend, Lachie, and I were hiking into the Amphitheatre at Royal Natal National Park in South Africa. Our goal was to reach the world’s second highest waterfall, an ambition that had seemed unlikely when we set out in mist that restricted our vision to under a hundred metres. We had already hiked for a couple of hours before reaching the chain ladder. The trek began at river level and wound its way up to high above the Tugela through indigenous forests and open grassland. As the crow flies, we didn’t cover a great deal of ground but the bends in the river valley were huge. It had been humid, sticky work but our mood had been light, despite the mist’s presence which threatened to obscure the fabled Amphitheatre rock wall, the same one used as the backdrop in the film Zulu. The hope was that the clouds would clear to reveal the full view and the Tugela Falls plunging off the Drakensberg Mountain escarpment. We knew the hope was slim – the mist had been just as thick when we arrived the previous afternoon. My own hopes sank further when the path reached the chain ladder. Signposting was not extensive along the path, though somebody had painted an arrow onto a rock, pointing away from the ladder. After fording the fast-moving embryonic Tugela River and an hour or so of following that arrow, we realised that it had been a red herring and we retraced our steps. At that point the chain ladder looked the likeliest way to continue following the path towards the base of the falls. Lachie, ever more intrepid than me, thought that it might be possible to go against the flow of the river where it had carved out a tunnel in the same rock wall that the ladder scaled. Against my better judgement, but desperate to avoid having to challenge my fear of heights, I followed him into the tunnel. When it became clear that we were going to have to wade and swim against the onrushing current, in the dark over some very pointy bits, even Lachie had to agree that it was too dangerous. At the top I rolled onto my back on the rock path, far harder than any bunk bed I had ever experienced, but relieved to be alive. With any luck, the rest of the hike would be straightforward. Luck was in short supply that day. The path ran alongside the stream and often directly into it. In places there was no path at all. We were obliged to hop over the boulders on the riverbed, the footing unsteady and slippery. All the time I kept gazing upwards optimistically, willing the mist to disappear. 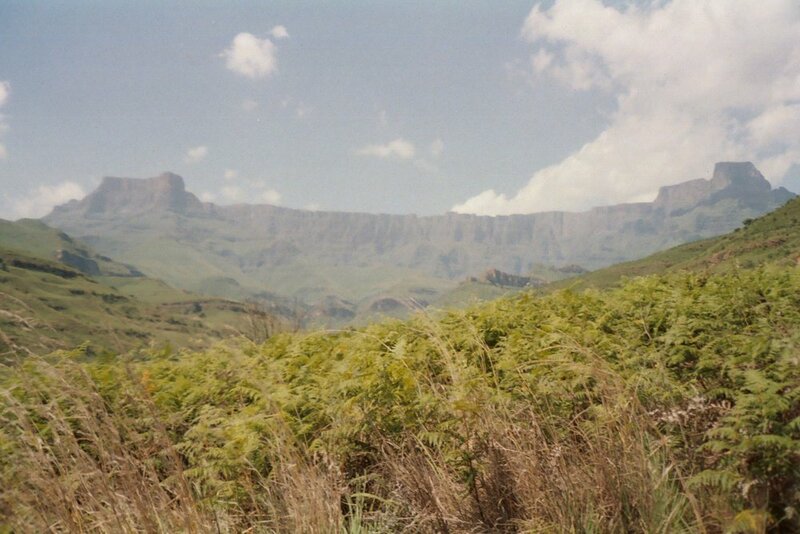 At one point, for a brief moment, the clouds did part and we both saw a thin silvery ribbon of the Tugela Falls. Our legs bleeding from cuts sustained on the sharp rocks, we decreed that there was little point in continuing as, realistically, the mist was there to stay. Once hope had been cast aside and reality allowed to enshroud us, the return journey was far trickier to negotiate. On the way up the chain ladder I had been driven on by adrenaline. Now I was despondent, the one fleeting glimpse of part of the falls being the only reward for all my bravery. Lachie went first, just below me and again he coached my quivering limbs through each and every movement. It took far longer. At times I just couldn’t shift. My muscles were locked in terror. When, finally, I made it to the safety of the path, Lachie stopped to splash some cooling stream water on himself. I charged on. It took him half an hour to catch up with me. “What’s up?” he enquired. Having nothing but cuts and scrapes to show for the day’s expedition, each step on the walk back to our accommodation felt heavy. Not even the perennially chirpy Lachie was particularly talkative. Physically it had been challenging, but it had put me through the emotional wringer too, forcing me to confront my fear of heights. I pulled back the curtains and there, the colour of Sydney Harbour on a sunny morning, were bright blue skies. The mist had completely cleared and we had unobstructed views of the Amphitheatre in its full splendour, a crescent of mountain ridge rising towards heaven. I was beyond happy. It felt like a kind of redemption. 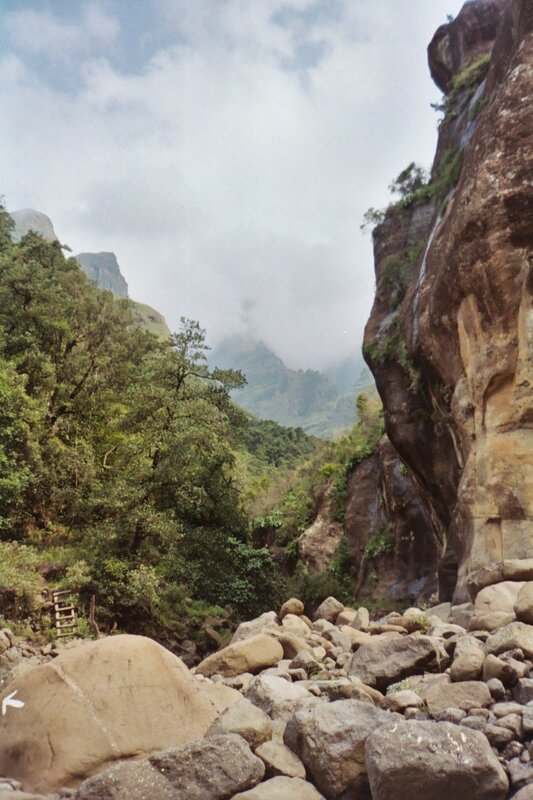 The Tugela Falls themselves were out of view, tucked away around a corner. It no longer mattered to me. Even if our busy itinerary had permitted the luxury of another day’s hike, there was no way I was taking on that chain ladder again. Richard Kitzinger gave up a career as a languages teacher and is now a freelance travel writer. For many years he lived in Sydney but has returned home to the West Country of England where he is currently reading for an MA in Travel and Nature Writing at Bath Spa University. He blogs at www.aroundtheworldin18days.uk and also creates bespoke travel itineraries for people wanting to benefit from his vast travel experience.